Despite widespread cancellations this grouse season, estates in the North Yorkshire Moors Moorland Group (NYMMO) are witnessing healthy, and in some cases full shooting programmes which in turn continues to benefit local hotels, restaurants and businesses. With grouse in short supply in other parts of the country, North Yorkshire grouse has been in high demand both locally and further afield, with three in every four grouse supplied from estate in NYMMO making its way into the kitchens of top restaurants and hotels throughout London. Game dealer L&A Dent works closely with NYMMO and the other regional moorland groups in England to supply fresh grouse breasts vacuum packed to outlets across the country. Andrew Dent, of L&A Dent Game Dealers, said: “Each season we take 90% of the grouse available from estates in NYMMO. This year we are down 70% on trade from last year due to the poor season currently being witnessed throughout the country, so this steady supply of grouse from North York Moors is vitally important to our business, it would be a disaster without it. People’s taste buds and attitudes to sustainably sourced food are changing and people are readily choosing to eat produce with provenance. NYMMO has been working closely with estates supplying grouse directly to local hotels and restaurants who are passionate about showcasing the best fresh and seasonal produce found in Yorkshire. A local business receiving grouse is retail butcher S Waind & Sons Ltd in Kirkbymoorside. One of the North Yorkshire hotels taking regular delivery of fresh grouse from Pennyholme Estate and Bransdale Moor, members of NYMMO, is the Michelin-starred ‘Star Inn’ at Harome. Andrew Pern, owner of the Star Inn, said: “We are firmly rooted in North Yorkshire and pride ourselves on modern Yorkshire cooking. 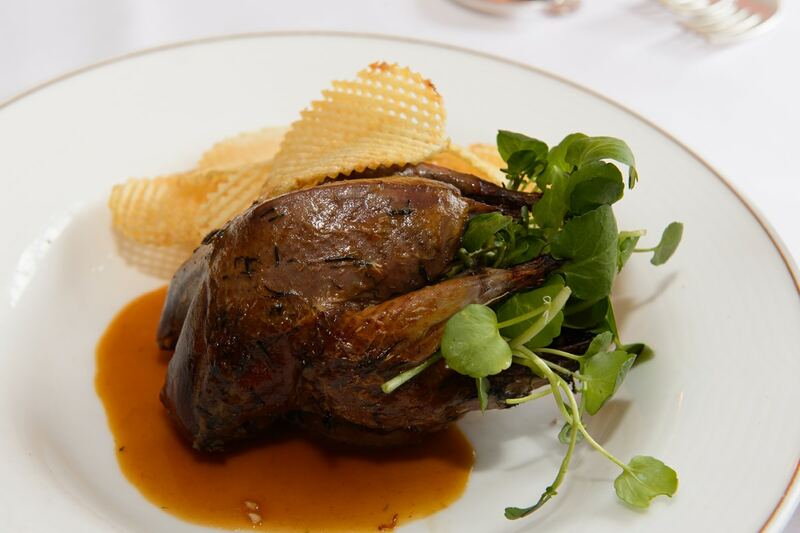 We place great emphasis on sourcing regional and seasonal produced with grouse being a firm favourite having been on our menus for over 22 years. Our current main course grouse dish includes a bramble and apple charlotte with sloe gin juice. We include grouse as part of our tasting menus and also offer a grouse starter which sells really well as guests might shy away from trying it as their main course. Tina Brough, of the North Yorkshire Moors Moorland Organisation, said: “Grouse is a delicious yet sustainable, healthy food source and we have been working closely with estates, restaurants, hotels and retail outlets to highlight the ‘hill-to-plate’ credentials of grouse. We have noticed a marked increase in the number of local outlets now stocking grouse as they recognise the market demand for it as a flavoursome game meat. Likewise, restaurants and hotel who have it on as a sell-out daily special.